President Rafael Correa may remain Ecuador’s dominant figure today, but deep fissures have developed among his political supporters. At the same time, his opposition, though relatively weak, continues to gain strength. The narrow margin by which the President’s 2011 referendum was passed has been viewed by the public as a landmark event that also could be said to represent a significant defeat for his administration. The alleged coup attempt against him revealed Correa’s political vulnerability, an undeniable factor in today’s Ecuadorian domestic affairs. Thanks to the high price of petroleum, Correa has had the ability to increase social spending in the areas of health, education, and infrastructure, but his administration’s investments have not succeeded in laying the foundations for a long-term public policy. In the next twenty months, Rafael Correa’s second and final presidential term that began in 2009, will come to a close. The story of the young and impetuous president who has weathered an attempted coup, endless criticism from a divided but increasingly boisterous opposition, and a relentless battle with the media, already has begun to be recorded in the country’s chronicles. Over the course of his time in office, Correa undeniably has nurtured a foreign policy that has isolated Ecuador from international markets and distanced the nation from Washington, which happens to be its main trading partner. Nevertheless, not unimportantly, the Obama White House continues to see Ecuador as a key player in the fight against narco-trafficking. Investments in education, health, and infrastructure have reflected some of Correa’s major achievements, but his government’s unbridled spending habits have left the country short of foreign exchange and vulnerable to the effects of the global economic recession. Additionally, cracks have started to appear within his party structure due to ideological differences dividing the nation. Though the possibility of a destabilization of Ecuador’s democratic institutions seems remote at this time, both Correa and his polity could use a dose of tolerance. They both must learn the important lesson of disagreeing with one another while firmly upholding the tenets of democracy. Rafael Correa’s second term in office has seen the start of a fiery ideological wrangle that has sharply divided Ecuadorians into two camps: the Correístas, staunch supporters of the left-leaning Correa administration, and the hard-line opposition. Aside from being caught in this clash of ideologies, the country also is just reaching the first anniversary of the failure of the alleged coup against the President on September 30, 2010. This commemoration also comes at a time when economic problems and violations of free speech continue to hollow out the country’s fragile social stability. The Ecuadorian government has been in the throes of a constant verbal war of ideologies with the opposition, which comprises both politicians and certain segments of civil society. This fervent divide has created a historical reality in a country whose democratic roots are markedly weak and the executive, legislative, and judicial branches fundamentally lack independence, adequate resources, and substantive power. Current tensions, primarily instigated by Correa, are likely to continue until 2013 when the next presidential elections are due. In Ecuadorian politics, everything seems to be either black or white; the middle ground hardly is able to cut out a slice of turf for itself. According to his political critics, Correa is the enemy, and in the eyes of the President, the enemies are private communication networks and critical journalists, as well as nascent but growing opposition groups, such as teachers, organizations, indigenous populations, and workers. Another major issue is that the government does not recognize that its naked use of power offends even some of those who are not particularly adept at the political game. On the other hand, the opposition refuses to recognize that the government on its own has advanced certain genuinely popular interests by investing as much as USD 6.6 billion in public spending in 2010 and over USD 3.3 billion this year. Many of the movements and political constituencies that previously had backed Correa have now distanced themselves from his administration for a variety of reasons. Nevertheless, an opposing political movement with the ability to produce a viable alternative to the President has yet to coalesce. The lack of a leading political contender capable of effectively challenging Correa at the polls can be explained by examining Ecuador’s political history over the past twenty years. Present-day Ecuador was born out of a predictably rancorous culture in which presidents were replaced on average every two years due to their inability to lead without military support or the high-price backing of the traditional political parties. Political candidates eventually fragmented due to electoral and economic feuds and civic paralysis. Currently, the country is paying the consequences of such inter-party bickering that has inhibited the functioning of strong national political figures. Although it may be true that not everyone agrees with Correa’s style of governance, it is a given that few complain about his undeniable commitment to bona fide social reform. At this point it is worth reviewing a bit of history, starting with the fall of Jamil Mahuad’s government (1998-2000) after his administration adopted the U.S. dollar as the national currency. Known as “dollarization,” the measure led to the replacement of the Ecuadorian Sucre with the dollar as the official currency in 2000. Gustavo Noboa later assumed the presidency and strengthened the policy. Although it was not a cure-all, it offered a certain amount of predictability. The International Monetary Fund (IMF) backed Ecuador’s adoption of this economic model and required that more than fifty percent of the country’s taxes be allocated for paying off foreign debt. Such a financial obligation meant that a large portion of the taxes earned from petroleum sales went toward repaying creditors. The IMF policy prescription was followed to the letter until Correa came to power in 2007. Declaring that a portion of Ecuador’s debt was illegitimate (Correa believes that part of the country’s debt had been amassed under a regime run by corrupt politicians and crooked businessmen), he unilaterally decreased payments to creditors and authorized the repurchase of ninety-one percent of the country’s defaulted foreign bonds. These new policies, which were strengthened by petroleum prices averaging above eighty dollars a barrel, gave way to a new economic philosophy that favored spending over saving and motivated changes in education, health, housing, and investment in the construction of hydroelectric plants. With formulations learned while studying graduate economics at the University of Illinois at Urbana-Champaign, Correa has developed an economic scenario that differs from that of the World Bank and IMF, and which became the source of the President’s resistance to the policy prescriptions being offered by these institutions. Though the effects of the global economic recession have reached Ecuador’s shores, the government has not felt hard-pressed to examine the risks associated with its emergency social spending. The Correa administration’s spending patterns also appear to be unsustainable in light of the fact that the country has just adopted a new and clearly articulated financial model upon joining the regional trade bloc, the Bolivarian Alliance for the Americas (ALBA), which is being credentialed with its own rules and currency (the SUCRE). In theory, even though joining this left-leaning trade bloc could prove to be an advantageous step, Ecuador still needs time to adapt to the new model, considering that a financial crisis is looming over the country. In practical terms, Correa has no compelling reason to dispense with using the U.S. dollar as Ecuador’s official currency, since its strength has facilitated frenzied spending on social causes as well as infrastructure. This has helped the country to maintain a degree of euphoria that has paid off for Correa. Correa’s most impressive social achievement has been in the area of poverty reduction. According to the book 100 Logros de la revolución ciudadana (100 Achievements of the Civic Revolution), there were five million people living in extreme poverty in Ecuador in 2006, the year of publication, but within four years the Correa administration had succeeded in leading seven hundred thousand of them out of that status. 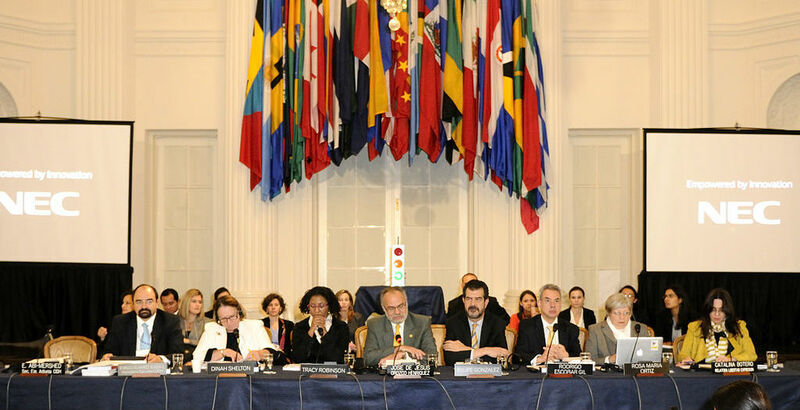 The Chamber of Industries and Production (CIP), usually quite critical of the government, also has recognized three noteworthy achievements: poverty reduction, an increased literacy rate, and improvements in infrastructure, though Bernardo Acosta, Vice President of the CIP, believes that “with the revenue it earned the government could have improved these indicators [even more].” He added that there are still four challenges pending: to create a better business climate, vitalize the labor market, formulate a clear trade policy, and control public spending. As part of his widespread social spending, the President has continued funding the country’s voucher program. Designed to help those most in need, the vouchers average a monthly payment of thirty-five dollars to the more than one million poor Ecuadorians. This paternalistic, populist voucher system, though effective, has been viewed as a political device to harvest votes and public backing and therefore has disdainfully been called “bonocracia” by anti-Correa critics. Correa can take credit for installing a government that has shown a genuine concern for its citizens’ well-being, but his achievements have not been without cost. His administration has not strengthened political structures to ensure Ecuador’s ability to protect itself against economic disruptions in the long run. The cost has forced Quito to incorporate into its 2012 budget a mortgage of fifty-three percent of its China-bound petroleum exports, leaving the country with meager savings. Ecuador certainly has embodied the popular saying: eat up today because you are not promised tomorrow. The alleged coup attempt against Correa has converted the Ecuadorian President into a hero among his supporters, but by his opponents he is seen as nothing more than a master of manipulation. He has been directly blamed for the fact that on September 30, 2010, a barrage of gunshots almost decided the fate of Ecuadorian democracy. On that day, regiments of the police and armed forces staged a protest against a new law cutting benefits for public servants. President Correa agreed to dialogue with the protesters, but was instead bombarded with tear gas. He was quickly driven to the police hospital, where elements of the Ecuadorian police held him captive. At midnight of that same day, Correa was liberated amidst rounds of gunfire. This historic event resulted in ten deaths and 274 injured civilians. Two police officers in the hospital where Correa was being held were injured as well. The President claims that his attempted assassination had been commissioned. According to Le Monde Diplomatique journalist Ignacio Ramonet, the head of state recounted, “I had to, at that point, ask for a gun to defend myself. Although I do not know how to shoot, I was not going to allow those bloodthirsty men to assassinate me … We have no doubt that it was an attempted coup.” Once the chaos subsided, the government conducted a purge of the police, and Correa started the campaign for a referendum on reforms to the justice system and the media. President Correa’s popularity rose following the attempted coup. His recent forty-five percent acceptance rate signals that while he continues to be in power, no other attempts to overthrow him will be sanctioned. That said, the incidents of September 30 also revealed Correa’s political weaknesses. His political platform had been battered by his captors, and in order to fix it, he tried to exact revenge, resorting to victimization as a result of the political affliction his tormenters had caused him that day. The blows landed on him by the security forces revealed that they continue to be the determining factor regarding the fate of Ecuadorian democracy. The narrow victory of his referendum of May 7, 2011 once again demonstrated that Correa is not invincible. Taking into account that those involved in Ecuadorian politics are intolerant of the fact that a wide range of ideas are good for democracy, the country has limited political strength at this point. Whether the current government likes it or not, the police-organized attempted coup has revealed the weaknesses of the Correa administration, and however weak the opposition may appear at any given moment, it still reflects signs of extreme bitterness. President Correa no longer appears as the invincible ruler, and his legislative majority is so narrow and fragile, even the simplest laws could become impossible to pass. If these formidable conditions remain, Correa will have to endure repeated defeats while the political habitat either hardens or cools down. Correa’s behavior and the speeches he has delivered have turned him into his own most effective adversary. For now, it is too late to retract his labeling of the Ecuadorian press as “ink assassins” and, therefore, history already has recorded him as the “democratic” president who trampled free speech by his failure to understand that a free press is an essential part of democracy, even if it has committed errors and bias. Correa may have blindfolded himself to the reality that trust and tolerance are essential to a functioning democracy. Translated from Spanish by COHA Research Associates Andrea Mares, Lauren Paverman, and Katie Steefel. To read more about Ecuador, click here.